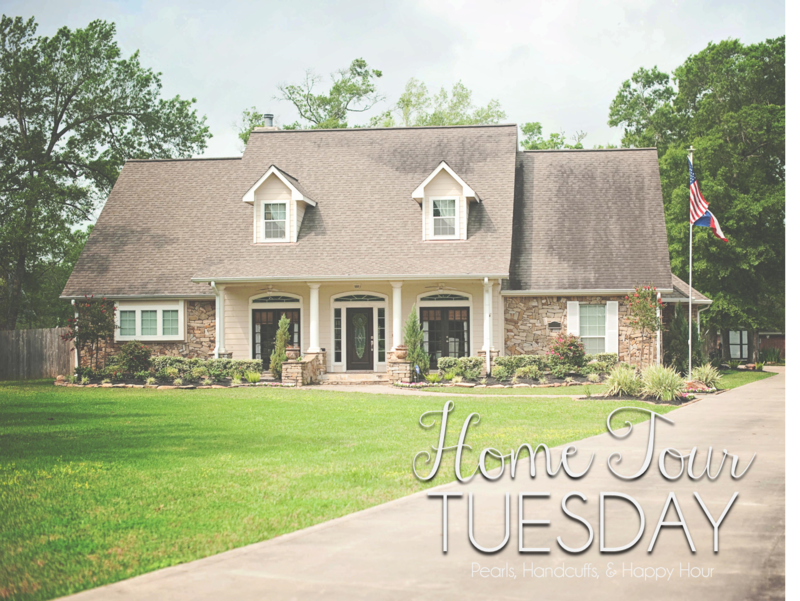 Pearls, Handcuffs, and Happy Hour: Home Tour Tuesday - The "Mystery Room"
Home Tour Tuesday - The "Mystery Room"
I post quite a few pictures of our little house on my Instagram from time to time and every now and again I'll have a few comments requesting a home tour. My house isn't tour worthy by a long shot. I love the pieces out of it, but I know it's not everyone's cup of tea. All that to be said, I thought it would be fun to tour the house room-by-room for the next few weeks. I love being able to look back at pictures and see how much the house changes as my taste in decor changes, too. Today we'll be touring the "mystery room". SO much better, don't you think?!?! That little coffee table isn't so little anymore either. I have a good friend, Shasta, who is so very amazing when it comes to interior decorating. I met her out shopping one day (Ross!!!) and she picked out the two rugs and suggested I layer them. I never would've thought of that and I LOVE the way it looks!!! Now the coffee table is the *perfect* size for that little space. 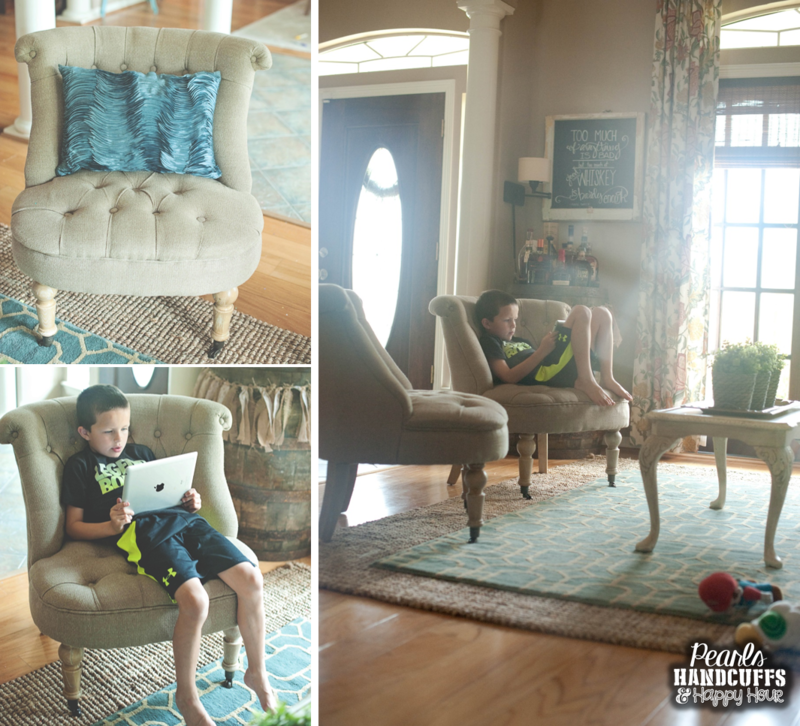 The old sofa was a hand-me-down and Mr. Spouse DESPISED it. Really, it wasn't my favorite piece of furniture either, but it was free and I like free. However, it ranked pretty low on the cute scale and that was the first thing we replaced when we started redecorating. I adore the loveseat we finally settled on. It's the perfect style for this space. We added a little more light in the form of two floor lamps and although they're nothing fancy by any stretch of the means, they fit perfectly. I found several other floor lamps I loved, but they were just too bulky and cumbersome for that area. I'm sure I could've found something a little *nicer*, but I really do love the way these look!! We took down that scary gallery wall and streamlined it with a few mirrors. I really wanted a gigantic mirror and spent weeks looking for the perfect one. I even considered a gallery wall of botanical prints. I couldn't find a thing I really liked...I even bought a few things to try out and ended up returning them shortly thereafter. I was at Pier 1 one day and found that round mirror and had to have it, but when I put it above the loveseat it was just too small. So I took those two side mirrors out of my guest room and repurposed them for this space and love the way it turned out. The bookshelves are staying for now. I think I'm going to have my brother build me a couple of new bookshelves with more of a natural feel. We've had those bookcases for about 8 years and I'm sorta ready to retire them. When I'm standing in my kitchen, this is my view. Those columns are a recurring theme throughout the main area of the house. We have 8 of them to be exact. We are going to replace them with reclaimed wood columns, but we're trying to figure out what we're going to do with our flooring first. We currently have wood floors, but the color isn't our favorite. We're thinking of having the floors sanded and restained a darker color. Then we'd like to replace the entryway tile with either a whitewashed, red brick OR hardwood in a herringbone pattern. And this is what I see when I'm sitting in my little chairs. 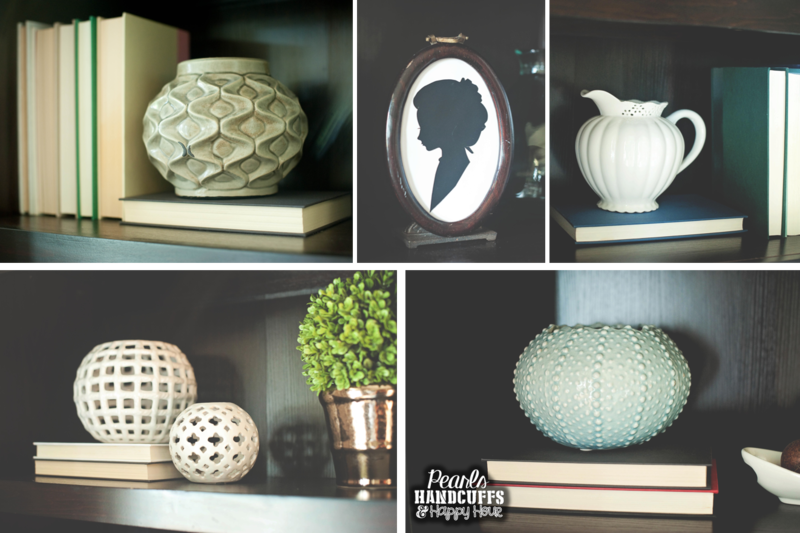 The bookshelf decor got a makeover, too. I'd still love to redecorate them again in all honesty. I have an idea of what I want, but I want my new bookshelves before redecorating. I turned the spines of all my books toward the back of the shelves...I feel like it looks so much cleaner with the pages visible. I had all these little odds and ends type pieces that had no home and now they do. That little silhouette is me!! HA! I'm not the kind of person who has pictures of myself all over the house at all, but this silhouette brings back such great memories. I was about 14 years old and in Paris with my grandma and cousin. We went shopping and this sweet little old man was walking around the streets cutting silhouettes and grandma insisted on having one made of me and my cousin. When I'm standing in the living room looking out to the street, here's my view. I need to fix my curtain rod. Dangit. But seriously...doesn't it look so much cozier now?! The curtains are from Pottery Barn and it took us about two years of living in our house before finally deciding on new drapery. We have 4 sets of french doors that can all be seen at the same time, so I wanted them all to match. It took forever to find something I didn't think I'd tire of too quickly and after a year of looking at them everyday, I can honestly say I still love them! We also redecorated the little corner in the left of the room. It was originally home to this great litte claw foot table that's been in my family for years. I wanted to add a bar cart to the corner because I figured when we redecorated it would make a great game/sitting room and perfect for entertaining. Then I came home from out of town one day and my precious husband was all, "uhhhh...I bought a whiskey barrel." WHAT?!?!?! I had every intention of keeping that whiskey barrel in the garage where he was storing it, but after some thought, I figured we could try it out in the "mystery room". I wasn't planning on loving it, but I do. I absolutely LOVE this little corner. My husband has become a bourbon connosieur. Most of those bottles he's had for what seems like forever. He is fascinated by the history and how it's distilled and loves adding to his collection. 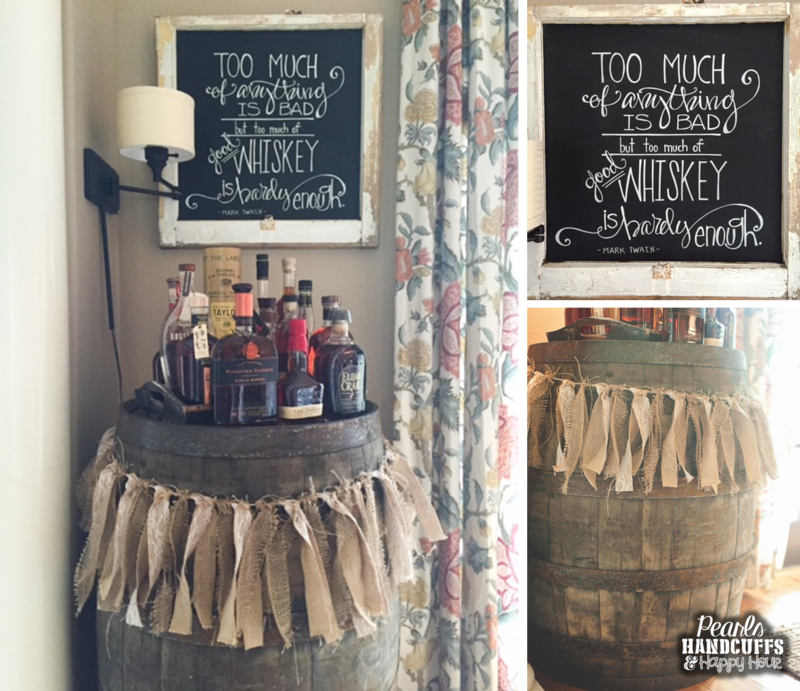 This barrel is the perfect space to showcase his collection and it's such a great little conversation piece. I know this isn't everyone's cup of tea...and some may even frown on such an addition to the decor...but we love it. This whiskey barrel smells amazing inside and it's contents are completly gone :) It's such a cool piece and really lends itself to the feel of the house. I dressed it up with a little burlap rag banner I bought from a friend's mom and love the way it sort of dresses it up. My sister-in-law bought me the unfinished chalkboard window for CHristmas and when I opened it up I knew exactly what i wanted to do with it! I had been holding onto this quote for some time and knew that window would be the perfect place to write it. I could have bought the matching chairs for the loveseat, but I really wanted seating that was a little different. I don't like everything to be too matchy-matchy. I found these chairs at World Market and fell in love. They're just the right size and pretty comfy, too. The boys love them :) I always find them sitting in them and reading or playing games on my iPad. Love this space! 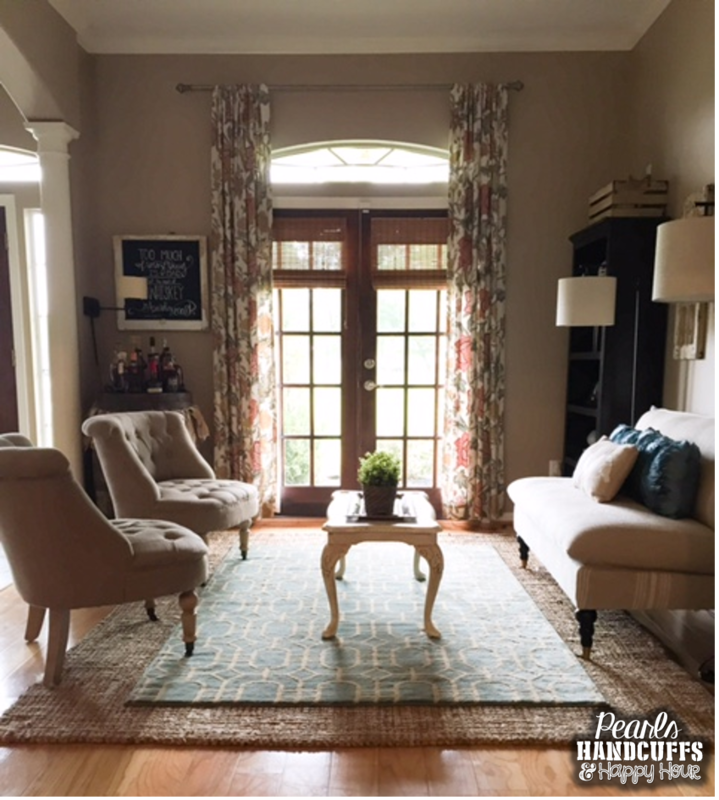 And I love the layered rug look too! I have to say that I disagree with you--you DO have a decorating flair! I love everything about your "mystery room". You put such thought into the final look but have such great ways of choosing the perfect items! I hope your floor changes go smoothly--I can't imagine going through that process of having the hardwoods sanded and restained. Thanks for sharing! You are so sweet, Jeanne! Thank you! And I'm thinking the flooring sounds like a nightmare. I'm sure we'll regret it as we're going through the process!!!! GAH!!!! We're just gluttons for punishment! HA! Looks great! 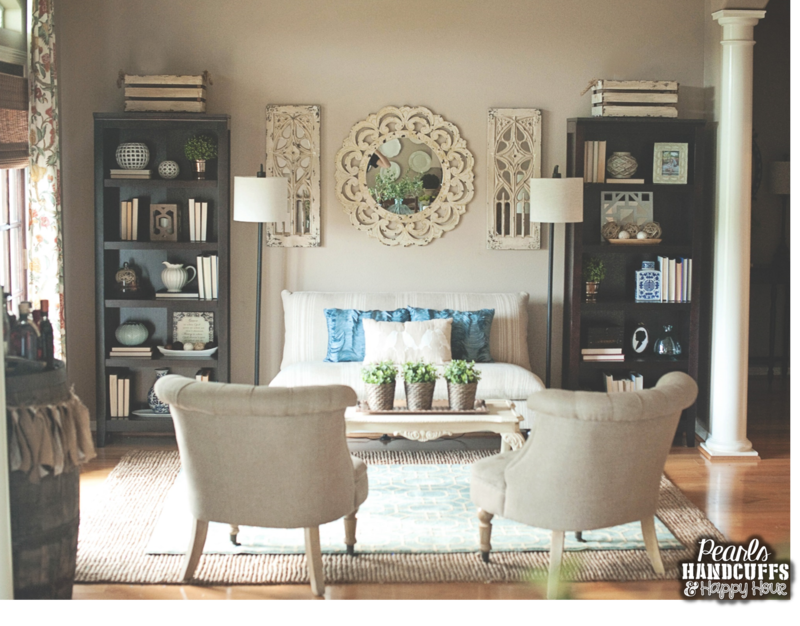 Have you thought of painting your bookshelves? (Instead of replacing...) I did that with mine and they took on a whole new look. 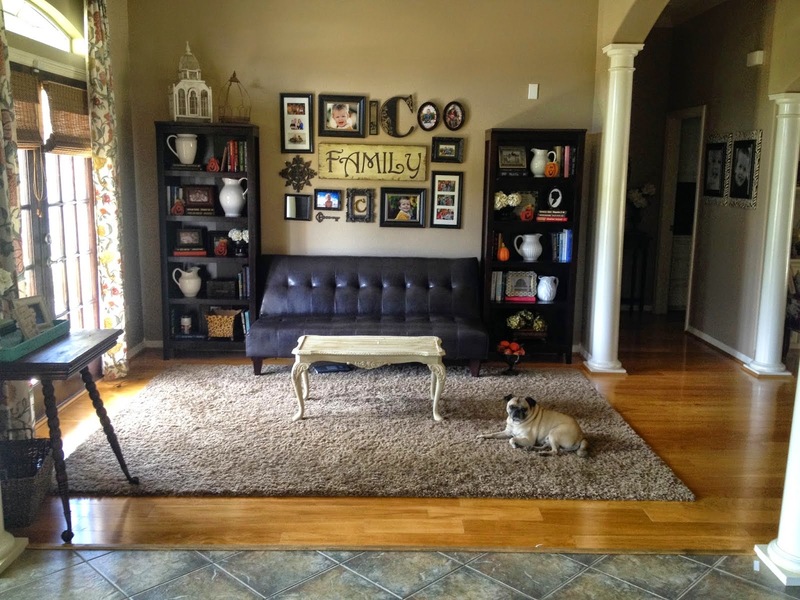 And I love the layered rug look....I need to make that happen! Thanks! Yes...I've thought about painting them, but they're the fake Target wood and the backs of the bookshelves just pop out, y'know!? I've also thought about wallpapering the backs for a patterned look, but then I'm worried there's too much pattern in that space. The struggle!!!!! GAH!!!! I'm way too indecisive to do anything! They'll probably still be sitting in that room...unpainted or wallpapered...for another 7 years! HA! Love the transformation. Gives me lots of ideas for our not so dining room - now piano room. Thanks April!! And those not-so-dining-rooms are always the best! We had one of those when we lived in Dallas and it was used WAY more than a traditional dining room would've been!!! Very nice space, you have a beautiful home. I noticed those zebra print photo frames in your hallway, where are those from? Thanks Renae! I made those frames :) I took two 11x14 plain white canvases and then covered them with a zebra print fabric. Then I took two 8x10 frames, removed the backs, and then adhered them to the top of the fabric covered canvas using velcro :) Hope that helps! Thanks, thats an easy enough DIY project I may have to tryout. 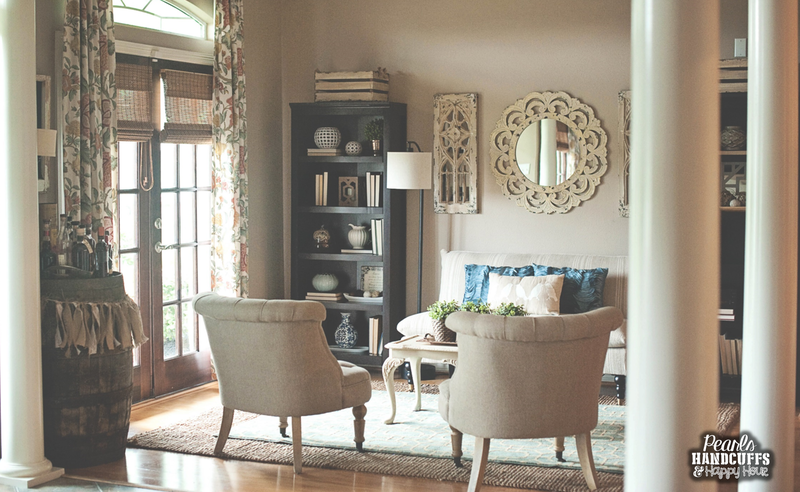 Awww...the Farmhouse style makes me swoon!!! Can I just shiplap everything and call it a day?!?!! 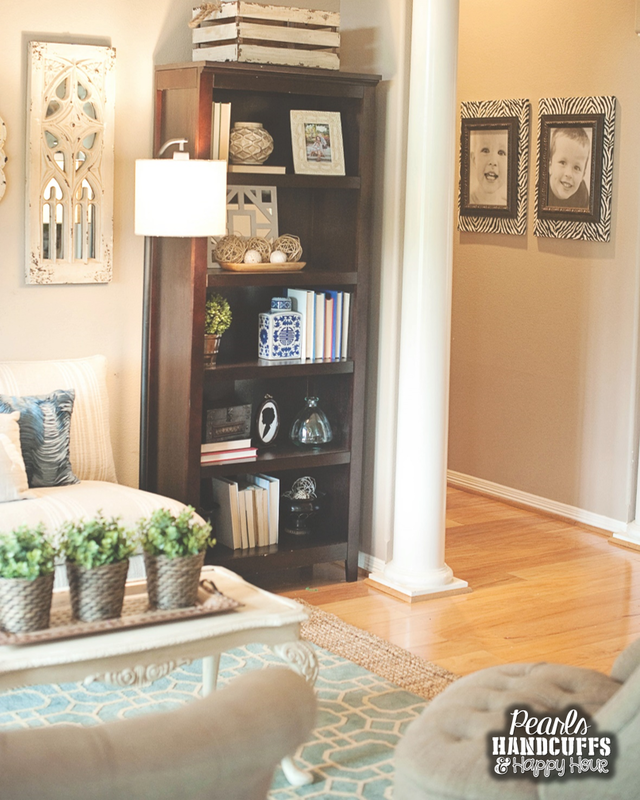 I LOVE your style- can you come to Ohio and help me design my remodel we are thinking about doing? K thanks :) I actually did buy those curtains from PB and am having them made into valences to go across the tops of my large living room windows- there are burlap-ish roman shades but I want a change of color across the top. Love that pattern! 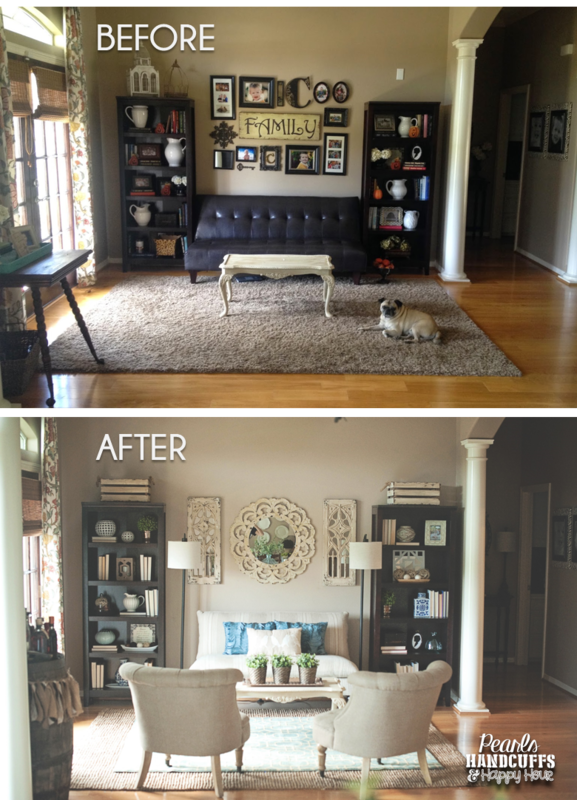 The whole room makeover looks amazing, from the mirrors to the rugs to the loveseat! Oooohh...a remodel sounds like SO much fun!!! 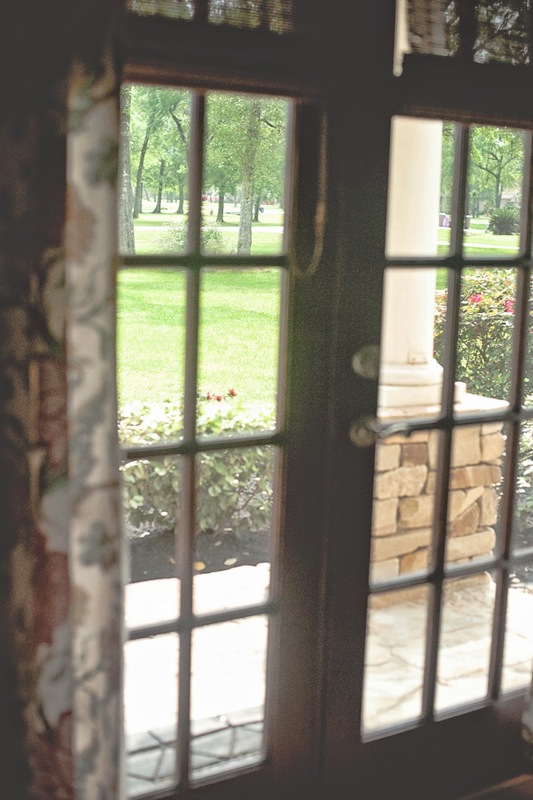 The curtains into valances sounds like an amazing idea and I love the idea of pairing that with with the roman shades...adds so much dimension! Your style is so great! I love the mystery room! Such a perfect, calming view when you are in your kitchen :) I need your help decorating my formal living room.. it's decorated with a hodge podge of things we have had and needs help! The "mystery room" looks amazing! Great job!! My sister is an interior designer, so I am always wondering if I am following the right "rules" so I love your philosophy! Can't wait to see the rest of your house. I watched The House Hunters clip... how cool! You sounded just like I did when we bought our house 2 years ago, all I wanted was white cabinets, but we ended up with brown...again! I am still hoping to paint them white one day... although my realtor said she would kill me, ha! A pool is on my wish list too.... it's the only way to survive this Houston heat! I'm sure interior designers everywhere would just scratch their heads at some of my choices, but darnit...I like it! HA!!!! Rules are made to be broken, right?!?!? ;) I finally got my white cabinets, but boy did everybody tell me not to paint them! I love it though!!! And I totally agree with you about the pool...I don't know how we'd survive the summers here without it!!! Stop knocking your "style" woman because I am definitely digging ALL of it!!! LOVE it!! Such a fresher look! You will never regret doing your floors if you choose to. We did ours last summer and I am loving them! They went from a yellowish/orange (yuck!) to a deep walnut brown, worth every penny! Please tour the kitchen next - I have been wanting to paint my kitchen and would love to see yours. I would love to lighten things up. Your decorating style is amazing!! I wish you could come and decorate my house! My husband and I have almost been in our house for a year and we still have not done any decorating. I'm very indecisive and don't even know where to start. Do you have any suggestions as to where to start? I live in a colonial style house and don't know if the farmhouse style is appropriate even though that is the style I lean towards? Your house is beautiful! I love everthing you've done! Do you mind if I ask what paint color you used for the walls? It's such a great neutral color! Thanks, Olivia!! The color we used is from Lowe's...it's a Valspar paint. If I remember correctly, I think it's called Timber Wood??? I think??? It's the perfect greige!! !